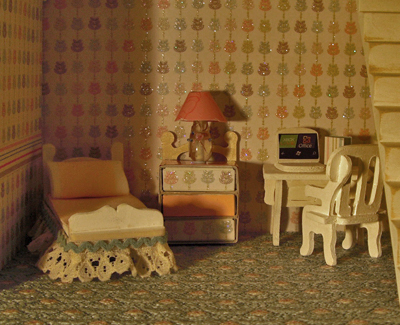 I didn't really like the little Cheval-type mirror that came with the punch-out furniture set, so I decided to use it for the back of the chest of drawers so it would match the child's bed. I cut the bottom bit off so just the top, decorative part would show above the unit. 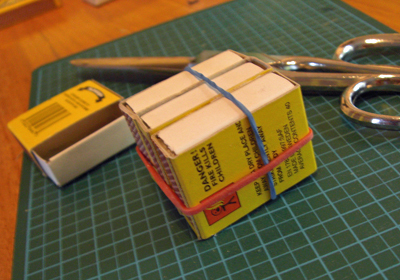 I started the project by emptying a couple of match boxes and then marking the centres so I could cut each component in half. 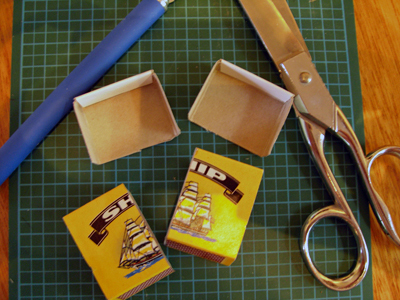 I flattened the outer part and cut it with a blade, but I had to mark the drawers and cut them with scissors. 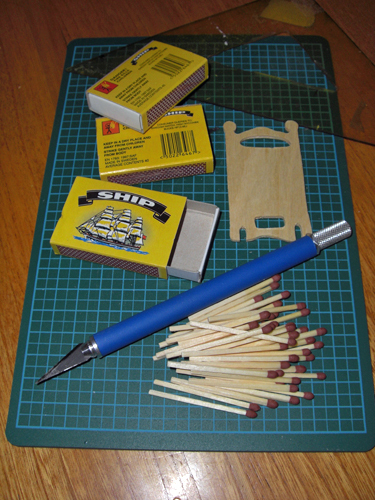 You can get three drawers out of two matchbooks. 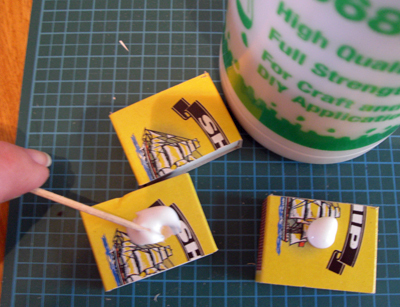 Cover the surfaces with the glue remembering you'll only need to glue two. 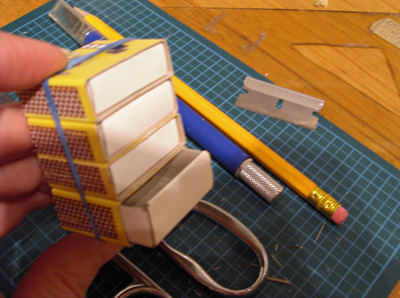 I glued mine with the drawers closed so there was more stability. I put some elastic bands around them making sure I kept them nice and square (I put them up against my triangle to check). 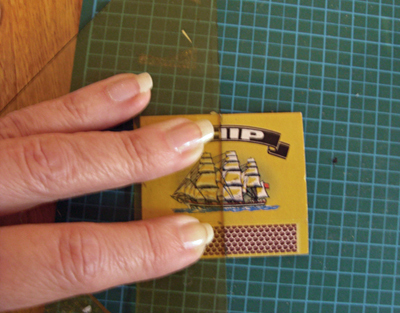 Then measure your strip of veneer paper and pre-fold with a nice, sharp fold. 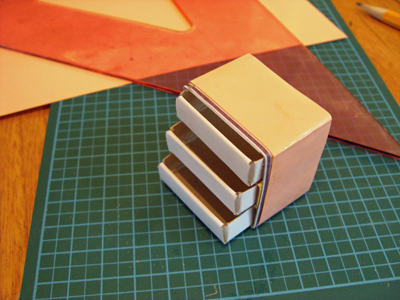 I decided against the stripey paper, so I glued another strip on top. I then cut a rectangle the size of each drawer front and glued them on. I still need to drill the holes in front for the drawer knobs. You can make one that is four drawers high as well, but I found the scale isn't really good for a 1/24 house. The three door one is almost too big, but I'm not really building Buckingham Palace here, right? I placed the unfinished back in this set up, and I haven't put on the knobs, but you can see it's a nice addition to the child's room. The lamp is a bead with a paper lampshade. I had to grind the bottom of the bead on a piece of sandpaper to make it stand up nice and straight. I will probably glue it to the unit so it's not always falling off. I made the laptop out of little scraps left over from punching out the furniture. It will be glued to the desk. Here is the four-drawer version. 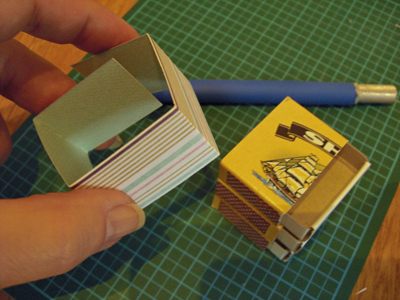 I glued on a thick piece of card (chipboard) for the back to finish the unit. 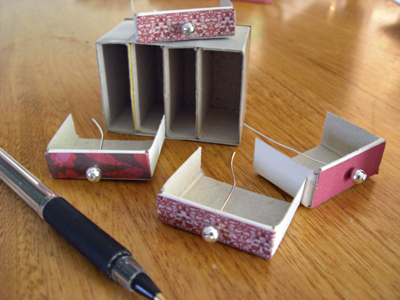 I decided to practise with this one on how to put knobs on the drawers. I put holes down the middle of the drawers, then inserted a jewellery wire (the kind with a little head at one end) into a silver bead. I then cut it shorter and then twirled the end tight against the back end of the drawer so the bead can't pull free from the front of the drawer. 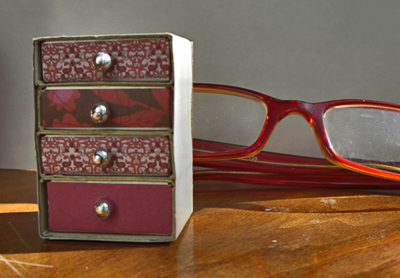 These chest of drawers are really cute and literally cost matchsticks! There was a dead space under the stairs in the master bedroom, so I wanted to make something that would fill that space and make it look like the little peeps have somewhere to store clothes besides the wardrobe. Since I ordered a small selection of wooden shapes to inspire my imagi-nation, I thought I'd give making a 'faux' chest of drawers a try. 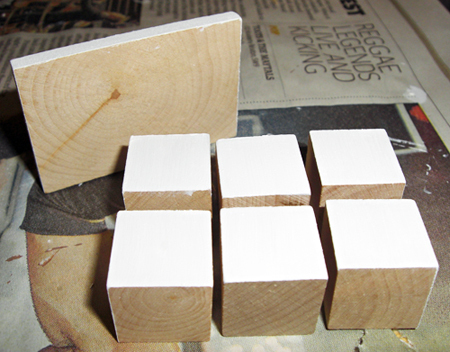 I primed and glued six 3/4" blocks together then glued them to a rectangular piece like the one I used for the washer/dryer. I picked up various colours from the room to give it a random effect. I used a the tiniest drill bit from my Dremel and drilled holes in the centre of each block. I used wire cutters to cut off straight pins to insert in each bead. 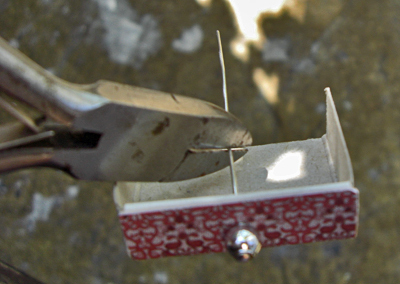 I dipped the pin in some PVA glue then inserted the pin and bead into the drilled hole. 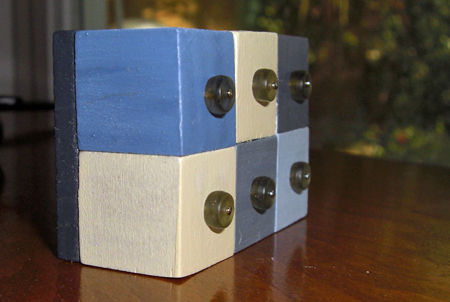 You could glue the bead directly to the block, but I figured this would give a bit more stability, even if it is a non-working drawer. The bowing-out is my camera being cheap - the 'drawers' are actually nice and straight. This is the result. It is a nice illusion and fits the shabby chic/DIY decor of the room. 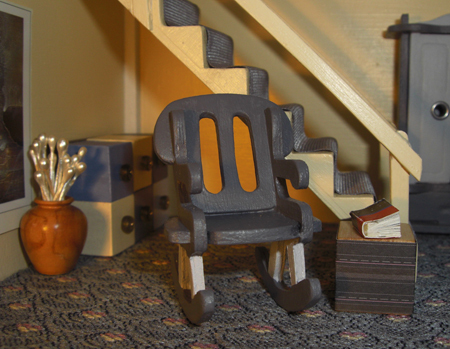 The 3/4" cube beside the chair is covered with decorative paper. The stairs are covered with grosgrain ribbon which gives a nice effect since grosgrain has those nice ridges. I can't offer a source for the wooden vase, but the display is made from floral notions normally used for flower stamens in a bridal corsage. I'll probably put a cushion on the rocker.